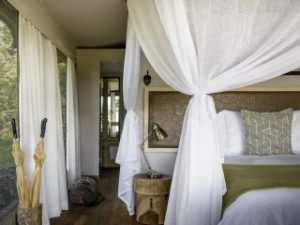 A classic tented camp located on a private concession in the Okavango Delta, Sanctuary Stanley’s Camp offers a varied game viewing experience as well as our unique elephant interaction. 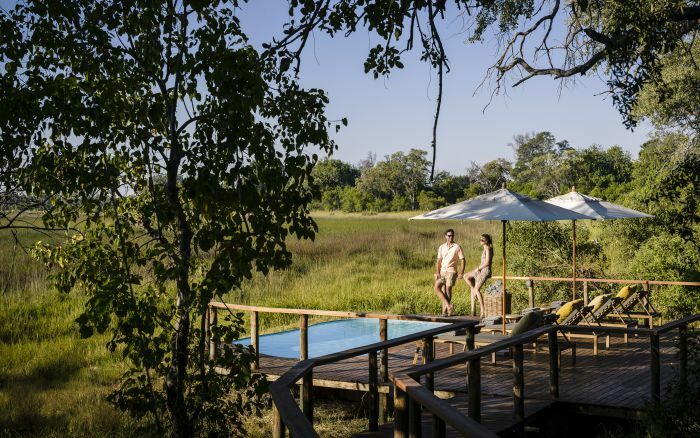 Stanley’s Camp is in a private concession bordering the south of Moremi. 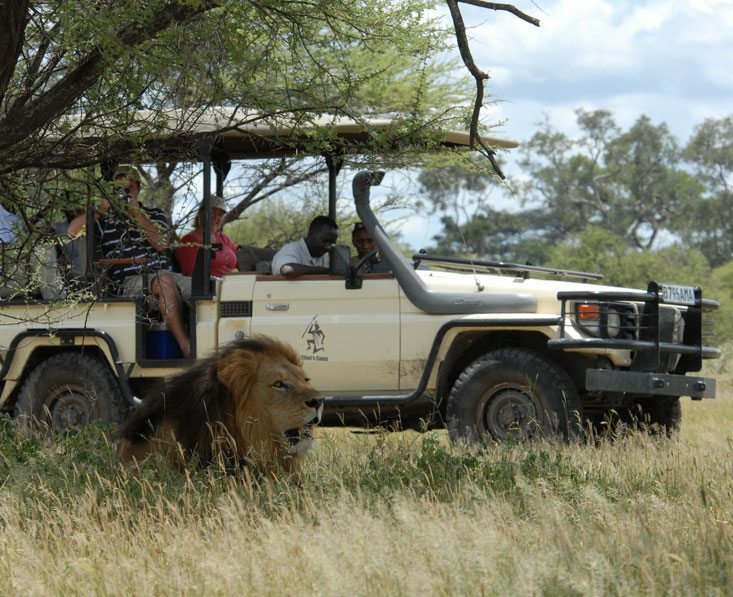 As well as the usual day game drives and seasonal mokoro rides you can go on guided walks and enjoy exciting night drives here. This is a game-rich area offering sightings of plains game and predators including lion, leopard, cheetah, wild dog and hyena. It’s also known as a great area for large herds of buffalo. 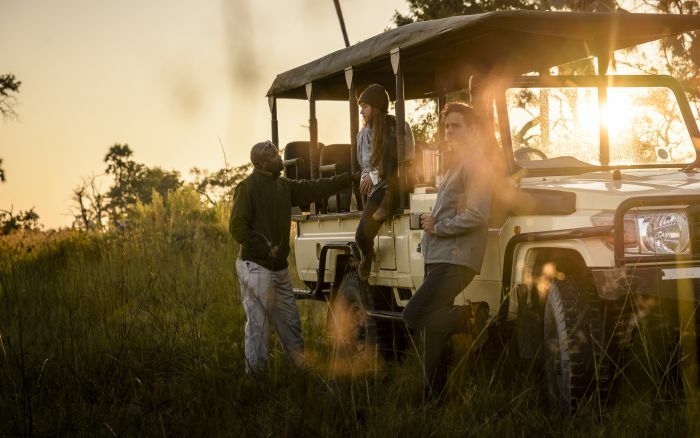 Its possible, though, that the highlight of your stay at Stanley’s Camp will be the chance to go walking with a duo of orphaned elephants. This is an optional 4-hour experience (at extra cost) which is only available from Stanley’s or Baines’Camp. It’s a moving and heartening experience and something you’ll never forget. You can read more about this Elephant interaction experience. The ten canvas tents were completely rebuilt in 2018. Each is set on an elevated platform and provides comfy and secure accommodation. At the front there’s a private deck with seating for those quiet moments between activities. The interior is spacious and has plenty of room for clothes and belongings. 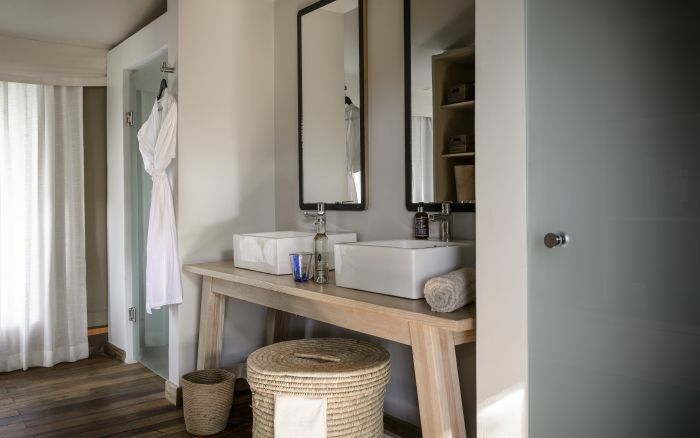 Each tent has an en-suite bathroom with a shower cubicle, double basin and basket of toiletries. 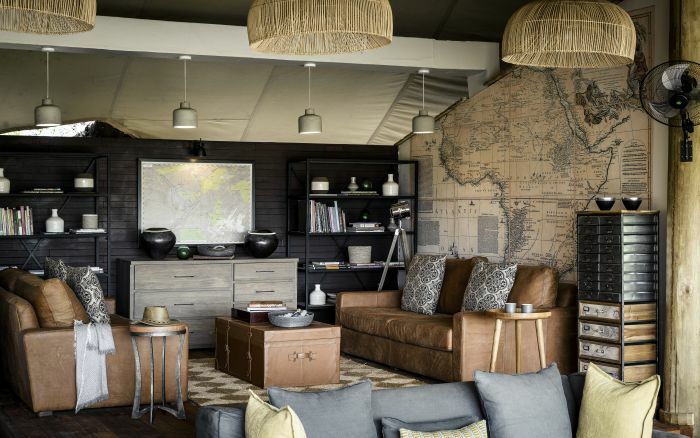 The main area is set under a high tented roof built around an ebony tree. It has a large dining area and a cosy lounge. You can stock up on camera film, batteries and safari clothes as well local handicrafts in the shop, and brush up on your natural history with a book from the library. Outside there’s a campfire, lit as darkness falls each evening. There’s a plunge pool for refreshing dips. 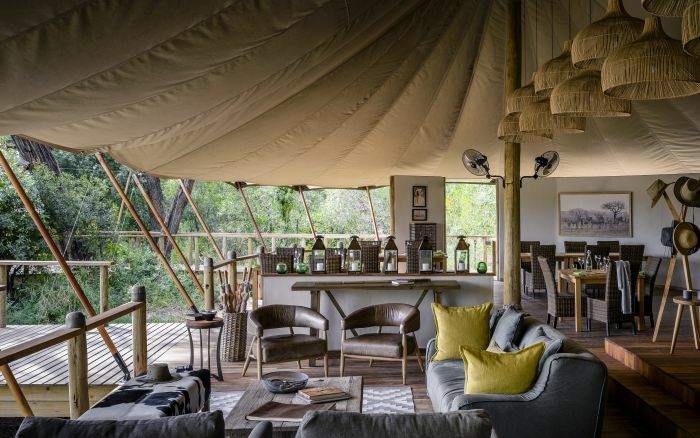 Meal times are never dull at Stanley’s Camp, with a choice of dining locations in and around the camp, so you might enjoy breakfast in the dining room, brunch in the company of the elephants, afternoon tea on the main deck and sundowners in the bush before the 3-course dinner back in camp. Staff are happy to arrange a private meals on request. Children of all ages are welcome. Children from 5-11 years can join regular game activities, at the discretion of the camp manager. Child minders are available at a nominal fee. Children aged under 15 years must share accommodation with their parents. Only children 16 years and over can take walking safaris. Guides can offer dedicated children’s activities such as poling a mokoro, making rope out of natural materials, finding water in the bush, identifying edible plants. Children over 9 years can take the elephant interaction experience (with parents). 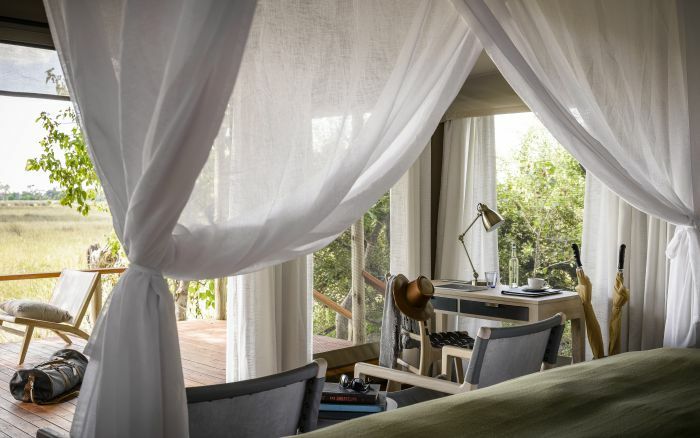 The tents at Stanley’s Camp are classic canvas models, with comfy beds, wooden furniture, en-suite shower rooms and private decks, providing homely rather than luxurious accommodation. 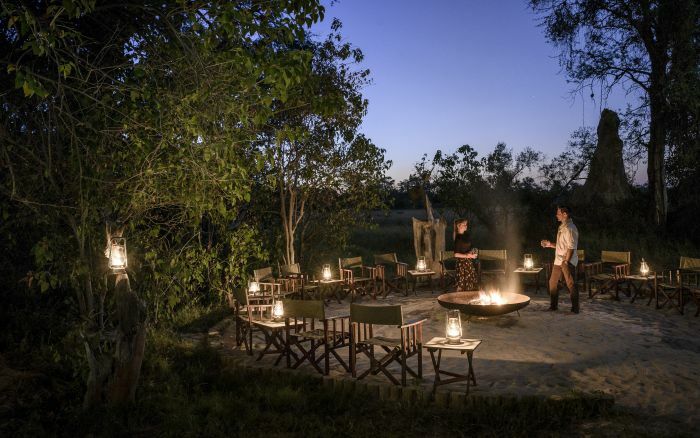 7 days from £4,525 pp Superb game viewing in the Okavango Delta and Chobe National Park combined with top quality accommodation.